The new website of all Polish projects conducted at Deir el-Bahari is already available. Please visit www.debprojects.uw.edu.pl/en. Among the products imported to Egypt as a result of Hatshepsut’s Punt expedition, there is a big bird, whose identity used to puzzle scholars since the discovery of the reliefs in 1858. It has been suggested that it might have been a crane due to its relatively big size, but this identification could not have been confirmed due to the fragmentary state of preservation of this part of the wall. While re-examining the famous Punt reliefs of Deir el-Bahari our colleague Filip Taterka noted the presence of yet another previously unknown representation of the bird in question. The latter is more complete, thanks to which it is now possible to identify the mysterious creature as the secretary bird (Lat. Sagittarius serpentarius), a species endemic to Africa, which has far-reaching consequences for the discussion on the exact location of the land of Punt. Moreover, the representations of the secretary bird of Deir el-Bahari are the only depictions of this creature known to date of the pharaonic period. We cordially invite for the lecture by Dr Zbigniew E. Szafrański about the recent works of the Polish mission. Moreover, you can follow the Facebook pages of Hatshepsut's Mission and Asasif Project, where the latest news are frequently presented. Unique representations of the secretary bird identified in Hatshepsut’s temple at Deir el-Bahari! 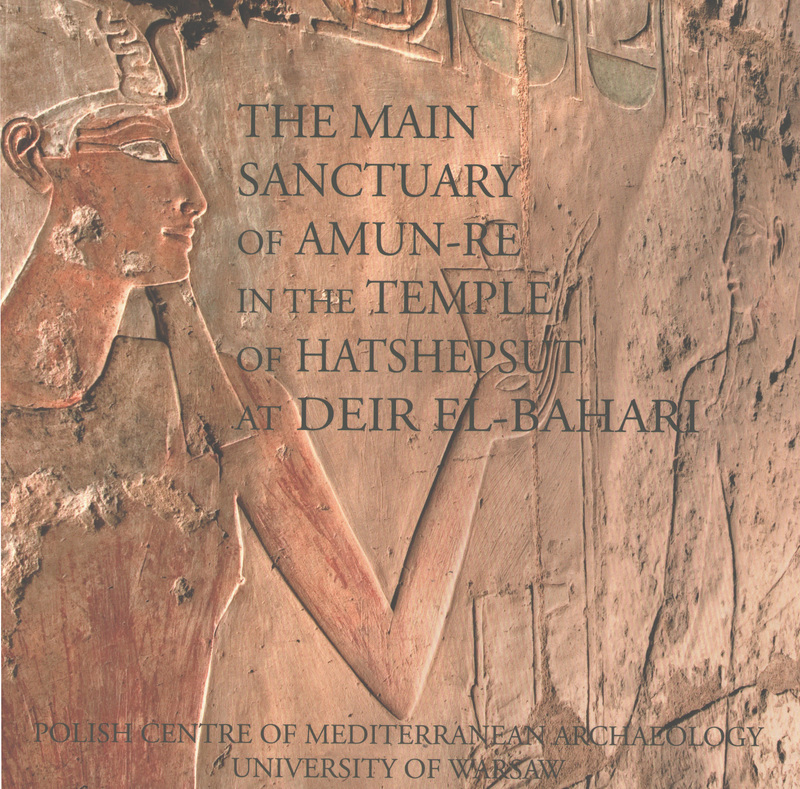 date: Monday 16th April 2018 at 6 p.m.
Booklet about the Main Sanctuary of Amun is available online! 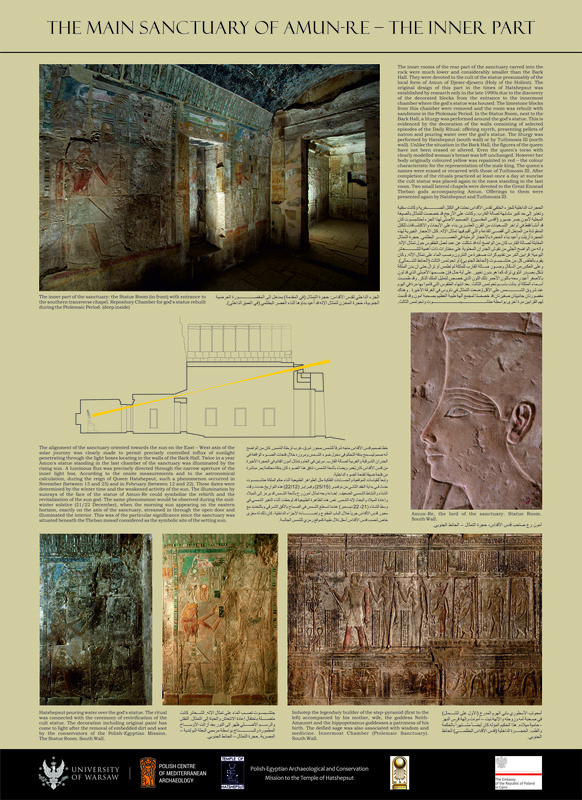 Booklet about the Main Sanctuary of Amun is available online! It can be downloaded HERE. The spring season 2018 of works at the Temple of Hatshepsut at Deir el-Bahari will begin in the end of March. Egyptological activity will be concentrated in the Lower South Portio, the Complex of Royal Cult and in the Southern Room of Amun. Conservation works will be carried out by the northern osiride statue in the Lower North Portico. The project of Thutmose I's Temple will be continued as well. The season will last a month. Photos of the spring season will be available on our fanpage on Facebook - HERE. For the opening of the Main Sanctuary of Amun, in the preceding it Ptolemaic Portico, two information boards for toursit were installed. Texts were prepared by Dr F. Pawlicki and layout was designed by A. Golijewska. Moreover, a booklet about the sanctuary was printed out (Z.E. Szafrański - editor, F. Pawlicki - text, A. Golijewska - layout and typesetting). Boards and booklet were sponsored by the Polish Embassy in Cairo. Polish Mission in the Temple of Hatshepsut wishes you Merry Christmas and A Happy New Year! 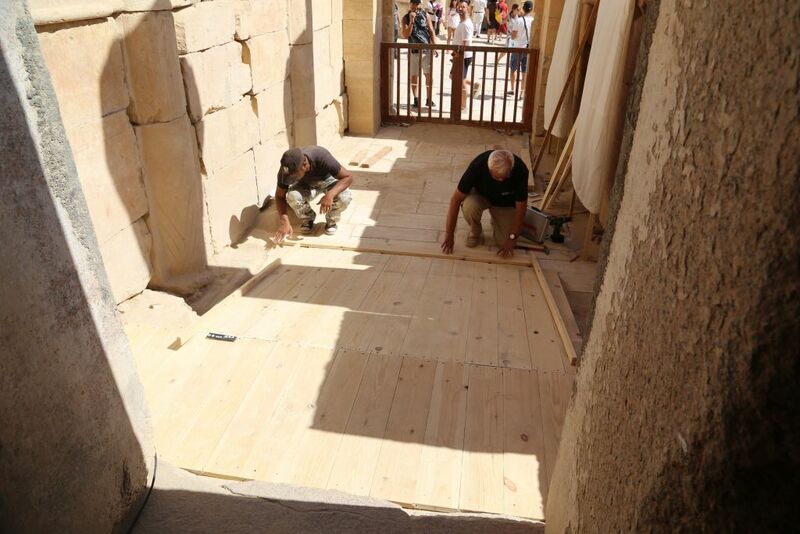 Another part of the Temple of Hatshepsut at Deir el-Bahari will be available to the public! Another part of the Temple of Hatshepsut at Deir el-Bahari will be available to the public. The opening ceremony of the Main Sanctuary of Amun-Re and the Ptolemaic Portico preceding it will take place on 9 December 2017. The ceremony will be hosted by the Egyptian Ministry of State for Antiquities, represented by the Minister of Antiquities Prof. Khaled el-Enani, and the Polish Centre of Mediterranean Archaeology University of Warsaw, represented by its Director, Prof. Tomasz Waliszewski, with the participation of the Polish Ambassador, H.E. Michał Murkociński, and the Governor of Luxor, Mohamed Badr. The PCMA will be also represented by Dr. Artur Obłuski, Director of the Research Centre in Cairo, and Dr. Zbigniew E. Szafrański, Director of the Polish-Egyptian Archaeological and Conservation Mission at the Temple of Hatshepsut at Deir el-Bahari. leading to the Lower and Middle Terrace. The Main Sanctuary consists of the Bark Hall and the Statue Room with three chapels. The first room housed the sacred bark of Amun and is decorated with representations of mentioned bark and members of Hatshepsut's family. In the next room, the Statue Room, where the figure of Amun-Re was situated, the most important rituals related to the cult of this deity were performed. The statue was illuminated by sunlight thanks to a system of skylights situated above the lintels of the entrances to the Bark Hall and the Statue Room. In the middle of the north and south walls, there are entrances to two narrow chapels devoted to the Ennead. The last chapel, and the farthest room, is the so-called Ptolemaic Sanctuary. Its present shape dates to the reign of Ptolemy VIII Euergetes II. During the works of Polish Mission, the original ceiling of the Bark Hall and the wall of the facade were protected, and a protective platform was built over the Upper Terrace. Thanks to these measures, the pressure of rocks and stones and the destructive influence of rainwater on the structure of the Sanctuary were eliminated. The walls of the complex were stabilized and their decoration reconstructed, including two of the four Osiride statues of Hatshepsut and the reliefs in the Bark Hall. Moreover, the preserved reliefs were cleaned and protected by restorers which brought out the bright colours of the original paint layer. 3D scanning was also carried out as part of comprehensive documentation work. Since work in the Sanctuary has been completed, it can now be opened to the public. 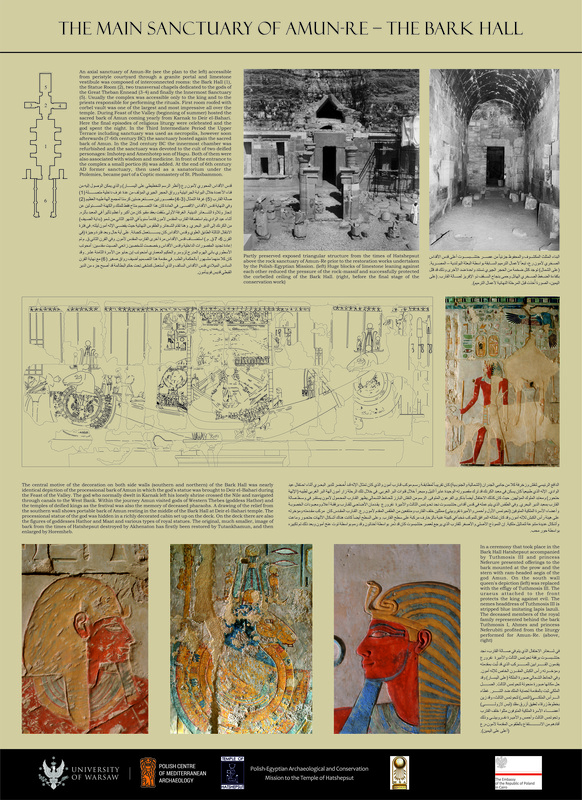 Research on the Egyptological aspects of the Sanctuary is conducted by Dr. F. Pawlicki (author of, among others, a guide booklet accompanying the opening) to be published as a monograph. Research on the Ptolemaic part has already been published by Assoc. Prof. Ewa Laskowska-Kusztal, Polish Academy of Sciences (Le Sanctuaire Ptolémaïque de Deir el-Bahari, Deir el-Bahari III, Varsovie 1984). National Science Centre of Poland has awarded the project "The Western Wall of the Portico of Obelisks of Hatshepsut's Temple in Deir el-Bahari in historical, ideological and ritual dimensions" by Ewa Józefowicz with a grant PRELUDIUM. The scientific aim of the project is the theoretical reconstruction of the original appearance of the western wall of the Portico of Obelisks (South Lower Portico) and the interpretation of the meaning of its decoration. The unique scenes of the transport and setting of two obelisks in Karnak and the foundation ritual for the Djeser-djeseru temple can be interpreted in three dimensions: historical (events, works, persons engaged, identification of obelisks), ideological (legitimization of Hatshepsut’s power by the foundation of and additions to temples, reasons for erecting the obelisks, their solar, Osiris and regenerative character, meaning of the scenes’ location within the decoration programme of the temple) and ritual (celebrations at the setting of obelisks and during temple foundation). Comprehensive studies of the western wall of the Portico of Obelisks are crucial to understand the role of the portico in the decoration programme of Hatshepsut’s temple, its ideological meaning and the historical events and rituals shown. The project will provide new data in all these dimensions. Constructing works are undertaken to prepare new parts of the temple to be open for visitors - Ptolemaic Portico and Main Sanctuary of Amun. Engineer Mieczysław Michiewicz together with Sayed Tg and rais Ragab Yaseen are constructing the platform above the entrance to the main sanctuary. The opening of the new visitor's path is scheduled for the beginning of December 2017. More photos are on Missions's Facebook page - HERE.